Hello from 6-7-8th grade Residential! Last year, St. Joseph’s Indian School started the tradition of hosting a dance for our sixth, seventh and eighth grade Lakota students. We invite the Chamberlain public school students to campus to join with our students at the dance, which helps build community among them. As part of St. Joseph’s strategic plan, we are being challenged to provide more opportunities to build relationships between our students and students from the local public school. We believe this will help them in many ways but specifically, once they reach high school, better relationships will make that transition smoother. Hosting community dances like this is a great way to help youth get to know one another. It also gives the students a chance to use their social skills and practice mastery in that area. 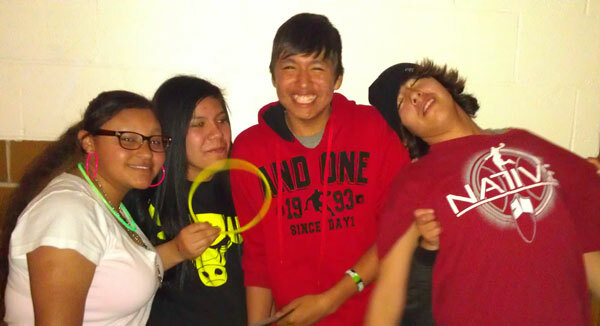 The Lakota students had a great time dancing the night away! Watching the process during the dance is fun for me and very similar, I think, to everyone’s experience at junior high dances. At first, all the students stand to the side looking at each other shyly. They all seem to be hesitant to get out on the floor and strut their stuff. 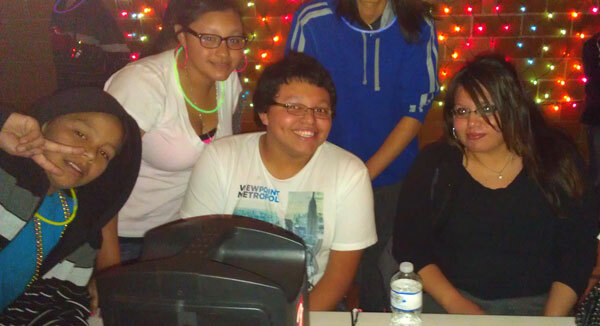 Chris, a St. Joseph’s senior, and Andrea, a St. Joseph’s alumnae, served as DJ’s for the junior high dance. After a couple of songs, however, a few of the girls get brave and start dancing. Before long, more and more are joining in on the floor. By the end of the night, everyone has gotten on the floor at least once. The students’ process of slowly warming up and finally dancing demonstrates growth in the area of independence. As usual, when the lights came on at the end, there was a collective moan from the crowd wanting more music and more dancing! Chris, one of our high school seniors, and alumnae Andrea provided the DJ service for the dance. They did a great job getting the students on the floor dancing and involved. The admission fee to the dance was $2 or two cans of food at the door. We were able to collect 156 food items for the local food pantry and around $30 at the door to donate to a local charity. This speaks to the Lakota (Sioux) value of generosity and helping our community when we can. All these lessons are very important and piece of what we try to teach our students every day at St. Joseph’s Indian School. These experiences give the students an opportunity to learn firsthand lessons that we hope stay with them for life. Without your support and prayers, none of this would possible. Thanks to all that support our work. We couldn’t do it with you! The last line should read “without you” instead of with you.